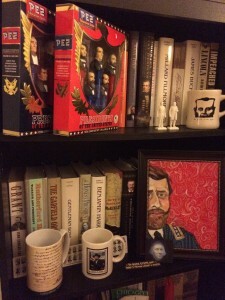 Five years ago I set out to read a biography of every American president in chronological order (a project I chronicle at my blog At Times Dull). When I wrote about the project here at The Millions three and a half years ago, I was one-third of the way through, and having just seen William H. Taft off to the big bathtub in the sky, I’m now roughly two-thirds through. For my own reference (and amusement, as the jollies are few and far between for a presidential biography blogger) I’ve grouped the presidents into eras as I go: The Founding Fathers, The Nation Builders, The Expansionists, The Compromisers, The Civil War Presidents, and The Beards. At last writing I had just reached Abraham Lincoln after a long string of Compromisers — the unhappy and mostly forgotten presidents who had to wade through the political morass of antebellum America. I have once again arrived at presidential legend, this time Teddy Roosevelt, after a long string of forgotten ones, this time the Beards. The Beards are Hayes, Garfield, Arthur, Cleveland, Harrison, and McKinley, and I have a specific fondness for them, as I have a specific fondness for the presidents of each era. Situated between Grant and Roosevelt, they oversaw the 40 years that pulled the nation from Reconstruction into the Gilded Age. It wasn’t pretty. While the government had been focused on the Civil War and Reconstruction, the civil service had become horribly corrupt, interstate commerce increasingly dominated a country that was designed for intrastate commerce, and the rise of corporations meant the corollary rise of organized labor, but domestic legislation hadn’t caught up with any of it. This era needed a new kind of leadership. It felt strange to me to go from the Civil “we-always-knew-this-was-coming” War to an era the Founding Fathers literally could not have imagined. One of my favorite presidential anecdotes took place during South Carolina’s Nullification Crisis of 1832, when a question of whether something was Constitutional led someone to just go ask 81-year-old James Madison. He was like “no” and that kind of settled it. Not only did The Beards not have the author of the Constitution around as their phone-a-friend, the Constitution itself had less and less to say about the practical reality of their time. The Beards are the unsung heroes who oversaw that transition and started laying the framework of modern America. 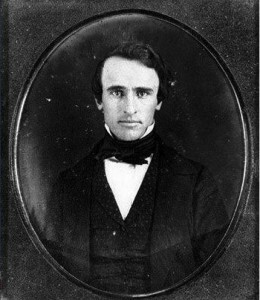 And when I say it wasn’t pretty, I don’t mean visually, because ladies and gentleman, Rutherford B. Hayes was shockingly good-looking. Look at that guy! Why don’t they teach this in school? That he grew a beard before his presidency is a national tragedy. Rud Hayes is one of my favorite presidents, and not just because I can get lost for days in his eyes. He took office after Grant, and while I love Ulysses S. Grant, he wasn’t a good president. Grant too frequently followed the advice of New York political boss Roscoe Conkling, who was a true villain. He came from a long line of New York political bosses — Martin Van Buren, Thurlow Weed, William Seward — who had enormous influence in the federal government. It was customary for the president to have a wary but necessary relationship with these slimeballs (the lifelong rivalry between Thurlow Weed and Millard Fillmore is pretty juicy, if you have the time). It all came down to civil service jobs. At the time, the president personally appointed every upper-level federal job in the nation. This might have been wise in 1790, but it made no sense, in 1876, for a president who was born and raised in Ohio to appoint the postmaster of Tulsa. But it was great if you lived in Tulsa, because then you could do a little campaigning for Rud Hayes — hand out some pamphlets or give a speech, maybe — and then when he became president write him a letter and say “I have a brother-in-law who would make a great postmaster.” This practice was called patronage, and as stupid as it was it was the only way to get elected, so everybody did it. The best civil service jobs were in New York, namely at the New York Customs House. From what I understand, if you worked at the Customs House you could just show up now and then, collect a bag of money, and leave without doing any work. If you were running for president and you wanted New York’s electoral votes, which you did, you had to ask for Roscoe Conkling’s help. He would get you elected and then he got to dictate who got all the New York jobs. Rud Hayes wanted civil service reform, but nobody believed it was possible to dismantle a system with such a tight hold on electoral politics. It’s analogous to campaign finance reform today — nobody’s against it, nobody’s going to do it. But Handsome Rud up there was determined, and to prove it he up and fired the man in the most coveted, most notoriously corrupt civil service job — New York customs collector Chester A. Arthur. Rud didn’t run for a second term. He knew that his reforms had burned too many political bridges for him to stand a chance at re-election, so he fell on his reform sword and bowed out. (He actually hadn’t won the election that made him president in the first place, but that’s another story.) When it came time for the Republicans to choose a candidate to succeed him, they had a problem. Rud’s firing of Arthur had split the party in two. On one side were the Stalwarts, led by Conkling, who wanted to centralize power and continue being corrupt buttheads, and on the other side were the Radicals, who thought the party should stop coasting on Lincoln’s reputation and start enacting social change. Neither faction was large enough to push their own candidate through, and as much as the Radicals disliked Conkling’s political machine, they needed his influence. Roscoe Conkling was still hopping mad about Rud firing Arthur, and they couldn’t afford to alienate him any further. As a compromise, they suggested unknown Ohio senator James Garfield as the presidential candidate (“Who’s that? Well, whatever,” everyone said), and let Conkling hand-pick the vice presidential candidate. Conkling, in a fit of dramatic revenge, chose Chester Arthur. Indeed. And yet Arthur’s one term presidency wasn’t full of the monkey business everyone expected. Potentially abashed by the dire predictions for his administration, he did his best to simply carry out the party platform without injecting his own ideas. He distanced himself from Conkling, and even supported civil service reform measures, to every ironist’s great delight. At President Grant’s funeral, he found himself sharing a carriage with President Hayes, the man who, by publicly firing him, had given him a political career he never wanted. By all accounts they were perfect gentlemen. This period was full of presidents who seemed to rise to that position by accident. Hayes hadn’t won his election. Garfield was a compromise candidate. Arthur wasn’t even a politician (and he was probably born in Canada). Cleveland, Harrison, and McKinley were all elevated on the merits of their work ethic. The parties favored diligence over vision, a trend that continued until McKinley’s death gave us President Roosevelt and a new mold of president as political celebrity. But if At Times Dull has taught me anything, it’s that America gets a few great presidents and can survive a lot of mediocre ones, and after 225 years we still can’t predict which will be which. Most presidents do more reacting than acting, and to be a great president you have to react to something momentous. The Beards brought a lot of their own drama to the White House (Garfield had chronic diarrhea, Arthur and Cleveland both had secret medical problems), but the national issues they faced are ones we’ve stopped talking about. At least in the case of Arthur — who just wanted to complete the task entrusted to him without confirming everyone’s doubts — I actually don’t think he’d mind. Whether or not True Detective returns for another season and solves its woman problems, here is a list of crime novels where there’s a woman in charge. You might discover, like me, that you’re an accidental fan of the female detective. Let’s begin with the doubt I can’t eradicate: How do you write about a culture, and a place, that is not your culture and not your place? I recently published a novel, Last Days in Shanghai, that takes places in the booming cities of the new China. The story is narrated by Luke Slade, a young assistant to an American congressman, who has accompanied his boss on an ethically suspect junket to Beijing and Shanghai. Luke careens city-to-city — sleepless, wide-eyed — trying to determine the extent of the danger or corruption or misunderstanding he is ensnared in. While writing the novel, I learned to endure my hesitations about the conception, my angle of approach, the language, the style, the length. But I never made my peace with the question of how to represent China or individual Chinese people. More pressingly, I don’t think any peace is possible — or ethically permissible. I am a trespasser, and there’s no way to think myself out of that trespass. Many days, I still believe contemporary China is best left to Yu Hua and Ma Jian, to Xiaolu Guo and Han Han, to Yiyun Li and Liao Yiwu, to the manifesto of the students who gathered to protest in the streets of Hong Kong, and to the poetry of a desperate Foxconn worker. Of course, I wrote the book anyway — innocently, out of curiosity; but also guiltily, with a worry that my fascination was no better than an Orientalist gaze, on par with the old 18th-century fashion for chinoiserie pottery and rugs and folding screens. In essence, I tried to act as though two conflicting ideas are simultaneously true: that our cultural bonds define us absolutely and are basically inextricable, and that an outsider can nevertheless imagine a way into those shrouded and private places. I tell myself that fiction, for both writer and reader, is about pushing past the contingent circumstances of one’s own existence. The ability to briefly inhabit a life not one’s own seems to me a large part of what fiction offers us. Isn’t such imagining the beginning of empathy? Isn’t an expansion of the self necessary for certain forms of political solidarity? If we say that an American can’t imagine China, or that a man can’t imagine a woman, or a woman a man, or a black person a white person, or a woman now a woman of the 18th century, then what’s left for fiction to do? Worse, what’s left of our civic existence? I find it disconcerting to imagine a community can only be made of our nearest psychic neighbors, people more or less like oneself. And yet, I’ve come to believe that writing about another culture is like being the central figure in a Franz Kafka novel: You need to understand you’re guilty even before you’ve been convicted, even before you can articulate what you’re guilty of. And you must live with the knowledge of that guilt and absorb it into your project rather than seeking to expunge it. In looking for an ethical way of writing about China as an outsider, I radically constricted the focus of the novel. Last Days in Shanghai is a first-person account, narrated by a young American man, who is in a deep confusion about the China he is experiencing. His claims are partial. He can give an honest account of what he sees, but he’s reporting out of incomprehension. Writing the book was a constant struggle between my desire to give language to the upheaval in modern China — the dislocated and dispossessed and the people who profit from that dispossession — and my sense that I could only in good faith examine China, as it were, through thick smog. I confined myself, for better and worse, to Luke Slade’s account. If this explicitly narrow aperture excuses some of the narrator’s misunderstanding and ignorance about Chinese life, it still doesn’t let me, the writer, off of the hook — anymore than being unable to read street signs exempts you from traffic rules. In that spirit, I read as widely as I could. I bothered experts. I hounded the few people I’d met on my own trips to China. I still have shelves full of books about Chinese history and contemporary politics: histories of Mao Zedong, histories of Shanghai, histories of Chinese capital cities, the Silk Road, and Marco Polo. I shoveled data and detail into the book, only to watch it swamp Luke’s story. And then I had to make my peace: There were certainly other stories about China, but Luke’s story was the one I could tell. To throw off the blinders of his perspective was to risk the book devolving into a loose weave of dubious ethnographic vignettes. I cut and added, cut and added, read and read. For the years I worked, it seemed every week a new book appeared claiming to demystify contemporary China. Most of these books, I discovered, were by and for market forecasters or the global business class, useless caricatures written by eager apologists for a commercial atmosphere of corruption and environmental degradation. The books that were essential to me were the ones that resisted the familiar, potted history of Chinese political culture and refused to be confined to headline news about monetary policy, Internet censorship, or Tibet. Instead, the writers discussed below engage in the intimate work of examining specific lives as they unfold against the chaotic political and social restructuring of a country that has now seen a full century of revolution, revision, and economic upheaval. It’s difficult to adequately imagine the contradictions inherent in such a vast place — the competing interests of 1.3 billion people or their quiet strategies of accommodation and dissent — but, taken together, these books provide an excellent primer on the new China, one life at a time. My own novel would not have been possible without them. Accustomed as we are to stories like the one Pan tells about Shanghai — ordinary citizens steamrolled by China’s experiment in state capitalism — the true surprise of Chang’s book is the intimate view it gives us of the factory girls themselves. The girls turn out to be far more complex than the exploited provincial teenagers we might imagine. Chang follows several ambitious, smart, and stubborn girls from the provinces as they hop factory to factory in Shenzen and Dongguan, chasing better pay, better food, better treatment, and better lives. The more time Chang spends in the company of these young women, the more nuanced her view of these factories, the linchpins of our global consumerism, becomes. The hours are long, sometimes abusive, and the conditions uncertain at best. And yet compared with subsistence farming or paltry educational options in their home villages, many of these girls find factory life to be not a dire dead-end, but a ladder upwards. We can and should be rigorously critical of the abuse and exploitation that continues to thrive in these factories, but the work also offers money and mobility in a place where young women have long lacked both. Mexico’s book plants itself firmly in the territory of the new youthful China: Rock bands, KTV girls, prostitutes, hustlers, drug dealers. It’s ground level, gonzo reporting, though never sensationalistic or self-aggrandizing. As such, it’s filled with information on the kinds of business you won’t find discussed in market round-ups. “Prostitution has become such a massive industry,” Mexico writes, “that Chinese police have adopted a seven-tier system with which to classify prostitution-related activity.” The implicit thesis of Mexico’s book is that if we want to ponder China’s many possible futures, we should look not just to its history, its officialdom, or inside its factories, but also to its outcasts, criminals, artists, and dreamers. Guo’s novel opens at Beijing Film Studios, where a young woman searches for work as a film extra. This preoccupation with an extraneous life, a small existence seemingly destined to be forgotten or overlooked, never leaves the novel. Fenfang is a peasant girl from the countryside who doesn’t know “how to do anything except dig up sweet potatoes, clean toilets, and pull levers in a factory.” Her arrival in Beijing is turbulent, inside and out — an uncertain mind meeting a chaotic, changing city, “the least romantic place in the whole universe.” Twenty fierce, brief chapters stop-motion the reader through Fenfang’s life as she scrounges for work, falls in and out of love with an American boy, writes screenplays and fails to write them. Fenfang’s life follows the contours of many of Chang’s subjects in Factory Girls. It’s a novel that emanates from this historical moment when an entire generation is uprooting itself, trying to find purchase in the new China. Fenfang’s search for a life where’s she’s more than another extraneous girl makes for a rapturous book. I read it twice and bought copies for friends. This brief syllabus would feel incomplete without mentioning Guidi and Chuntao’s work — a blistering, politically explosive look at the bullying and corruption of the small time officials and bureaucrats who rule over the 900 million Chinese who don’t live in major urban centers. Local tyrants impose arbitrary taxes, embezzle the funds, and in many cases beat and imprison anyone who raises a voice to oppose them. “The rural cadres,” Guidi and Chuntao note, “are highly organized…legal representatives of state power in the countryside,” and as such they often act with impunity, shielded from official scrutiny by their sheer distance from the centers of power. Every year, aggrieved villagers descend on Beijing in droves, bearing petitions for the State Bureau for Letters and Calls, seeking redress for beatings, confiscatory taxes, wrongful convictions, and a thousand other outrages. Guidi and Chuntao’s account of these crimes was officially banned by the Propaganda Department of the Central Committee — which, one hopes, guarantees it a long black market life.